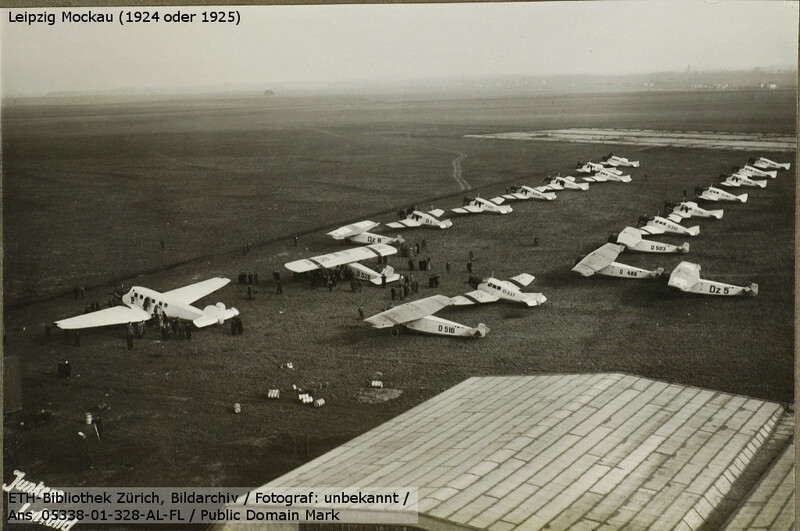 The Leipzig-Mockau airfield was opened in 1913. Among other things, a large airship hangar was on the area. 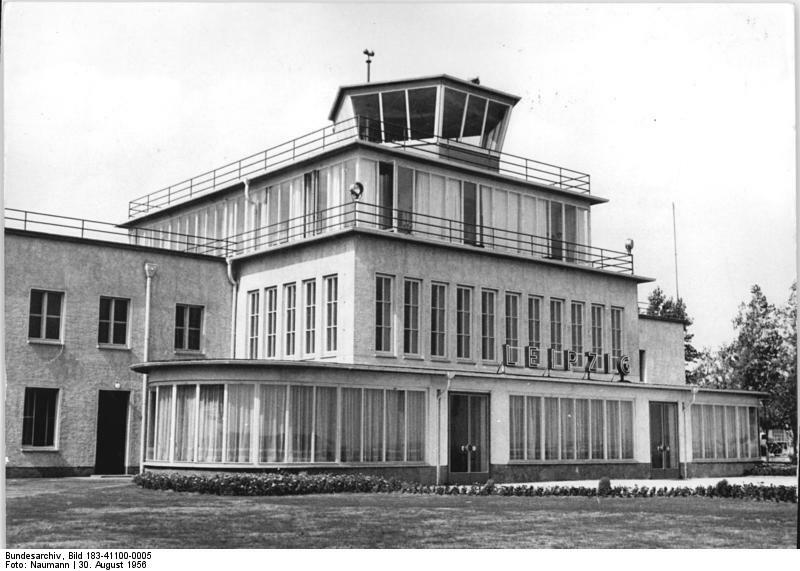 After World War I, Mockau became the airport for Leipzig, until it was gradually replaced by the newly built Schkeuditz Airport from 1926 onwards. During the Second World War, Mockau was mainly home of aircraft factories. In the first years after the World War II, the field was presumably little or not used. 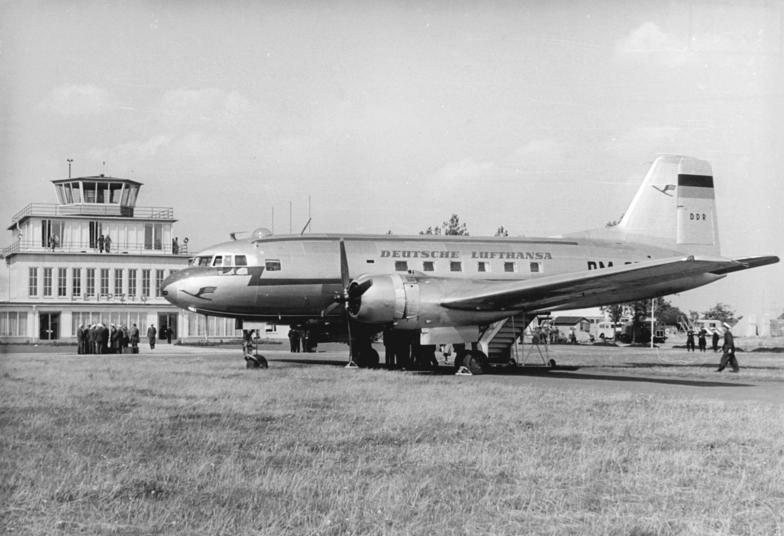 From 1949, the commercial air traffic to the Leipzig Fair regularly took place via Mockau. 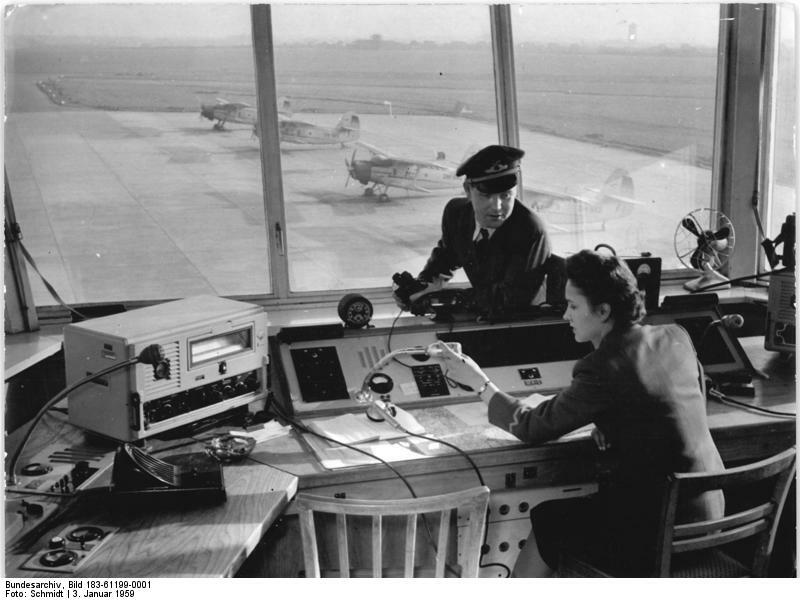 Later, the airport also served in the East German domestic air traffic. The runway was extended for the use of modern airplanes, but this was limited by the situation with the autobahn to the north and the city to the south. 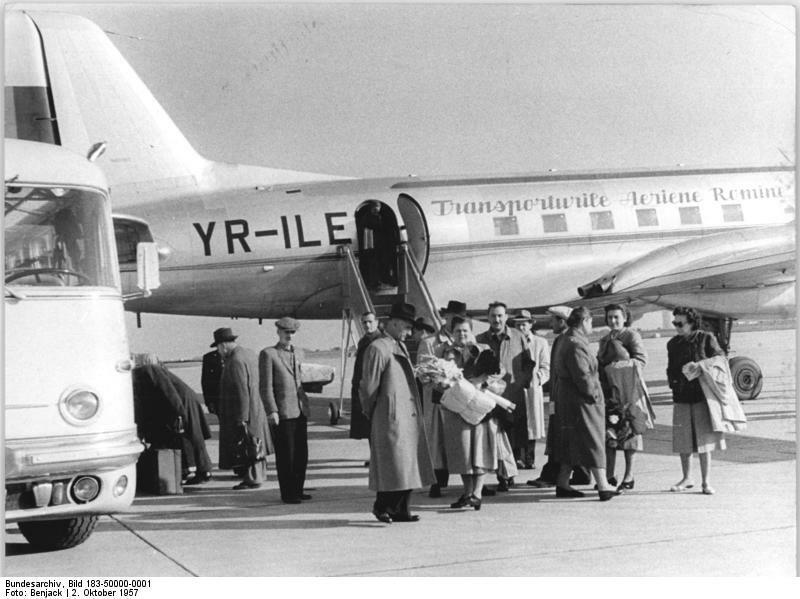 For this reason, from the 1960s onwards, the flights to the Leipzig trade fair were transferred to Schkeuditz Airport. 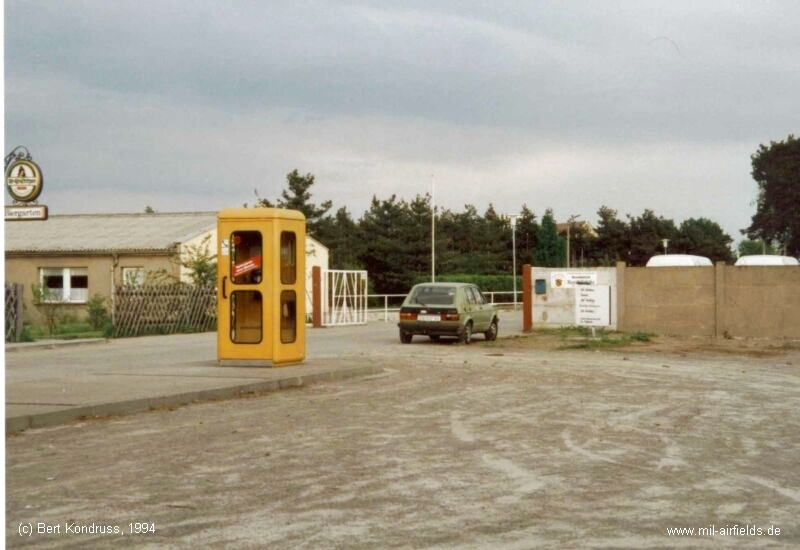 In 1972, the domestic traffic also moved to Schkeuditz, after which the field remained the base for agricultural aviation as well as for the premilitary Gesellschaft für Sport und Technik (GST, Society for Sport and Technology). After the political change, the Mockau airfield was used for a short time until it was finally closed in 1991. An industrial and exhibition area has been built here. Northern edge of Leipzig, south of Autobahn A14 between intersections AS23 and AS24. On the movement area black circle of 50 m diameter with smoke oven. On white cement plate the black inscription "Leipzig". Landing sign is always deployed. Red-white windsack on the factory building north of the airport. Völkerschlacht monument 9 km south of the movement area. Permanent night lighting not available. At the request of the operator and if an airplane is located in the vicinity of the airport: revolving fire of 740 000 HK on the lookout tower of the airport hotel. The fire shows flashing groups of 2 flashes and is turned off as soon as the aircraft is landing. On timely request at the operaor, landing lights from green, white and red fires in line parallel to the wind direction. Land from green over white to red, to the right of the row. In case of emergency landings, fire from torches. Land between two whites towards a red torch. Terrain: Good sod on a dry surface. Shortest rolling length: in north-south direction 700 m.
hangar II: 40.0 x 30.0 m.
In each hangar is a running crane with a load capacity of 1.5 t each. Spare parts for all German engine types in stock. For 20,000 l gasoline and benzene. Always 5000 l Shell gasoline and 4000 l Dapolin in stock. 1 front and 3 side ramps. Medical room available. Nearest doctor in the St. Georg hospital (1 km distance). Post office with telephone available. Passport inspection by police station. 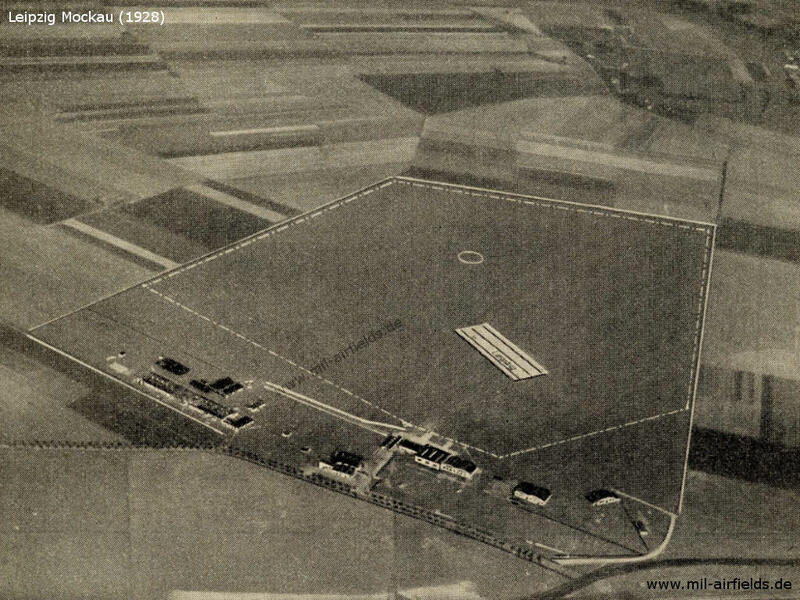 Civil airport for Leipzig, later base for agricultural aviation and for the former East German paramilitary organization Gesellschaft für Sport und Technik (GST). 29 June 1949 German civilian workers of a construction firm did repair work at the southwestern section of the LEIPZIG-MOCKAU (N 52/E 32) airfield. Three 13x13 feet holes, about five feet deep, had been dug and pipe sections, 75 mm in diameter, were lying nearby. An empty train of 50 open boxcars was standing on the railroad spur track. The field was guarded by German "People's Police". 05 July 1949 The LEIPZIG-MOCKAU airfield, though unoccupied, was guared by German "People's Police". ... and a ... entered the field to load empty gasoline barrels. 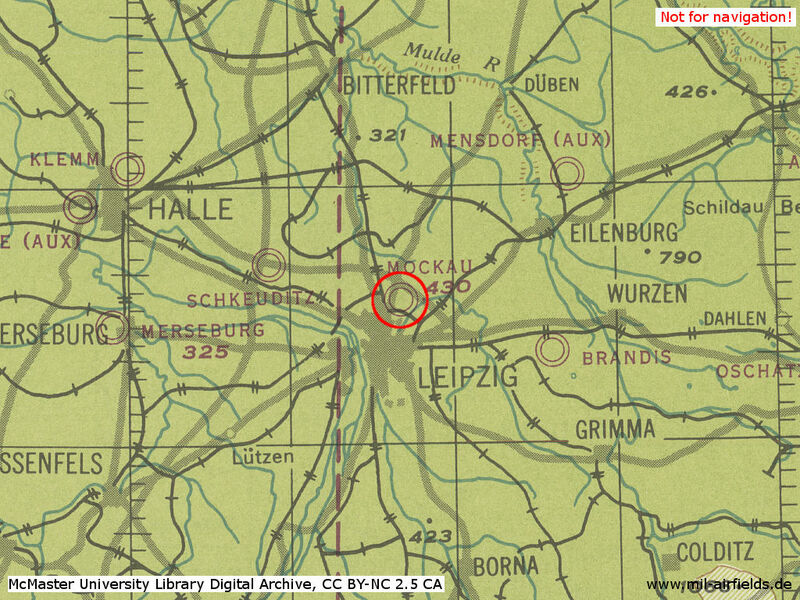 20 July 1949 The LEIPZIG-MOCKAU airfield was not occupied by soldiers or aircraft. The runway was intact and the landing field covered with high grass. All buildings except the flight control station, the headquarters building and one hangar were destroyed. German workers were doing construction work. 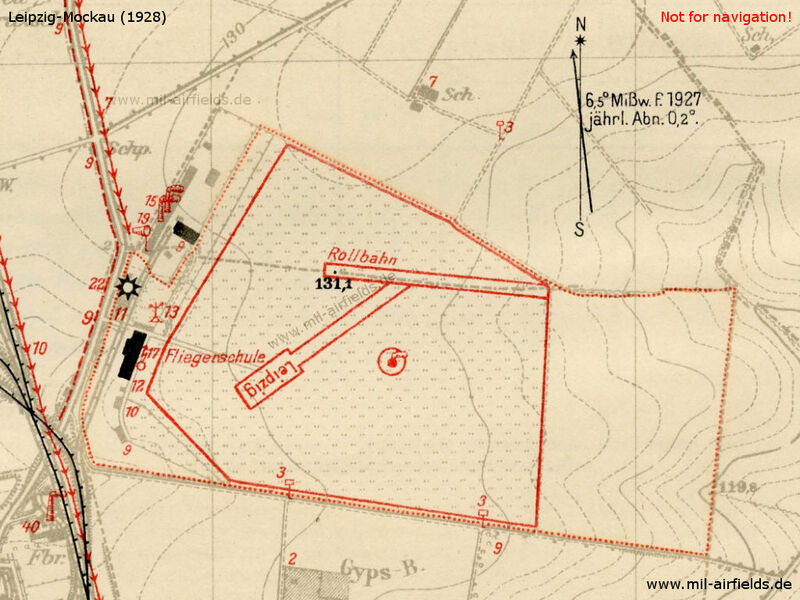 Comment Report shows that the LEIPZIG-MOCKAU airfield is not occupied by an air unit. From the construction work observed at the field it is inferred that the airfield is intended to be re-occupied. The reported motor vehicle ... to the air transport regiment, stationed in ALTENBURG. 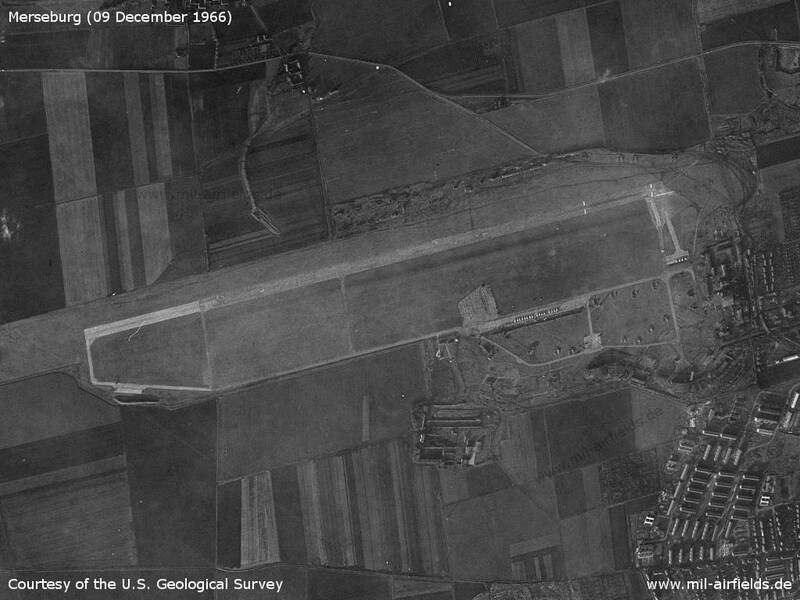 16 August 1949 The LEIPZIG-MOCKAU (N 52/E 21) airfield was not occupied by Soviet military units. About 30 German workers were busy filling holes and craters at the airfield. 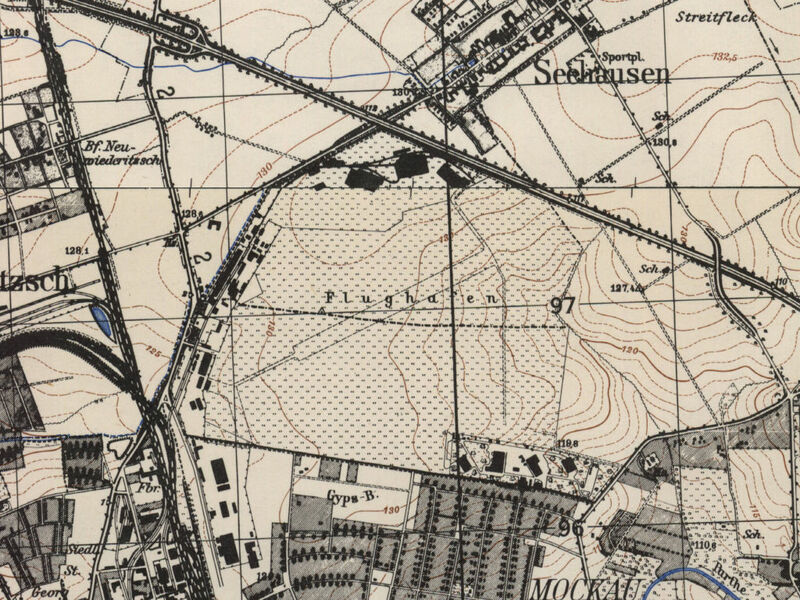 16 to 18 August 1949 The LEIPZIG-MOCKAU airfield was unoccupied and unused. All airfield installations, except for the former airport restaurant, which had been newly furnished, were destroyed. A long freight train was standing on the field spur track. 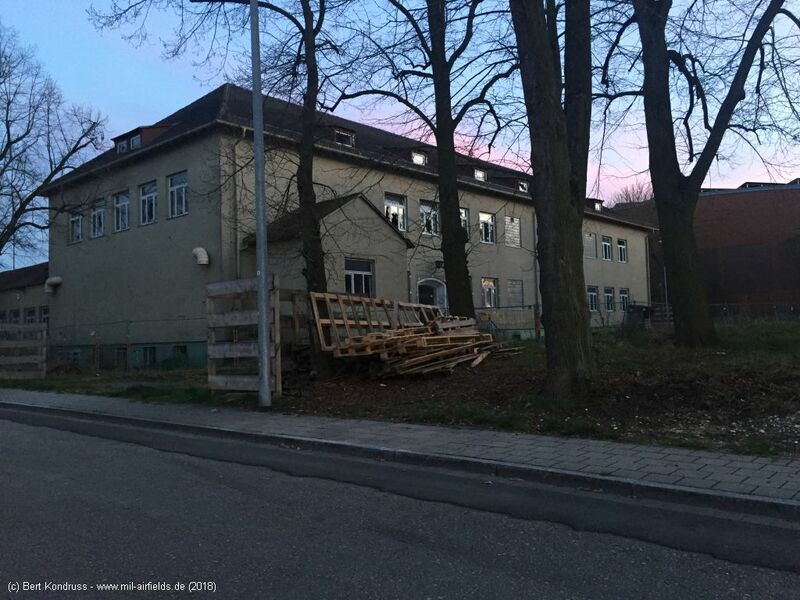 A German police detail was observed in a cantonment building at the edge of the field. The landing field was serviceable. Boundary and obstacle lights were not seen. 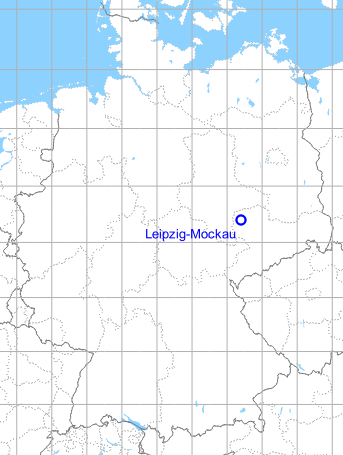 18 August 1949 The LEIPZIG-MOCKAU airfield was not occupied by the Soviets. Twelve to 15 German workers were engaged in clearing work. The airfield buildings were demolished. No technical installations were observed. 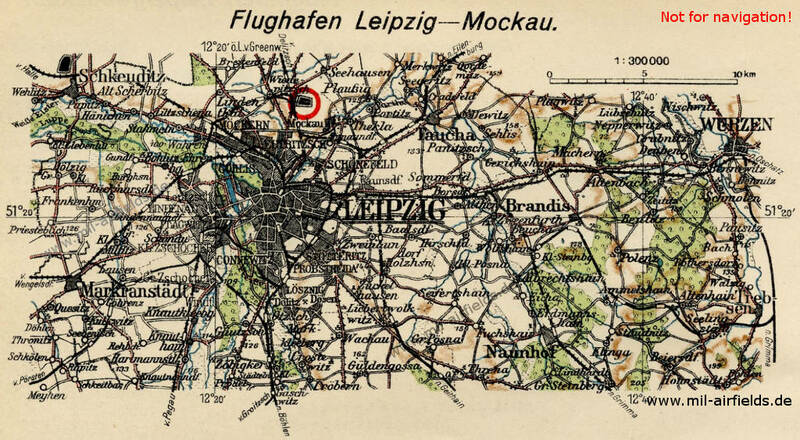 Comment Three independent sources are in accord in stating that the LEIPZIG-MOCKAU airfield is not occupied by an air unit. According to this report - which is considered credible - the occupation of the field has not changed since 20 July 1949. The statement that the airport restaurant was newly furnished was corroborated by a press report, according to which the LEIPZIG-MOCKAU airfield was scheduled to be used by commercial aircraft during the LEIPZIG Autumn fair. 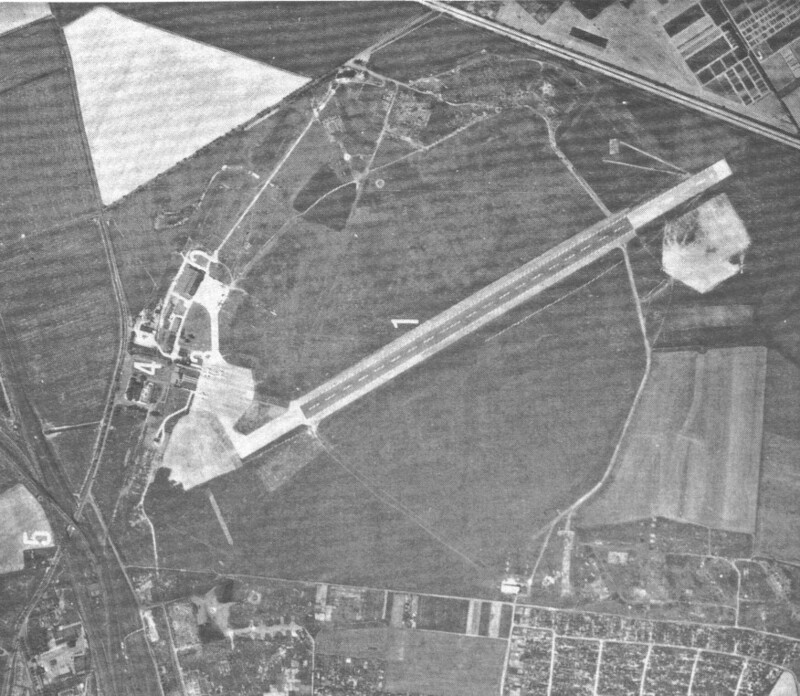 The LEIPZIG-MOCKAU (N 52/E 21) airfield was unoocupied from 16 to 18 August 1949. The airfield administration building and some other brick and wooden buildings located on the western border of the field were intact. A police detail of about ten men was quartered in one of these buildings. Empty freight cars were standing on the spur track. The fuel tank installations at the southwestern corner of the landing field were demolished. Comment: Report confirmed the observations made by ... during the same period. 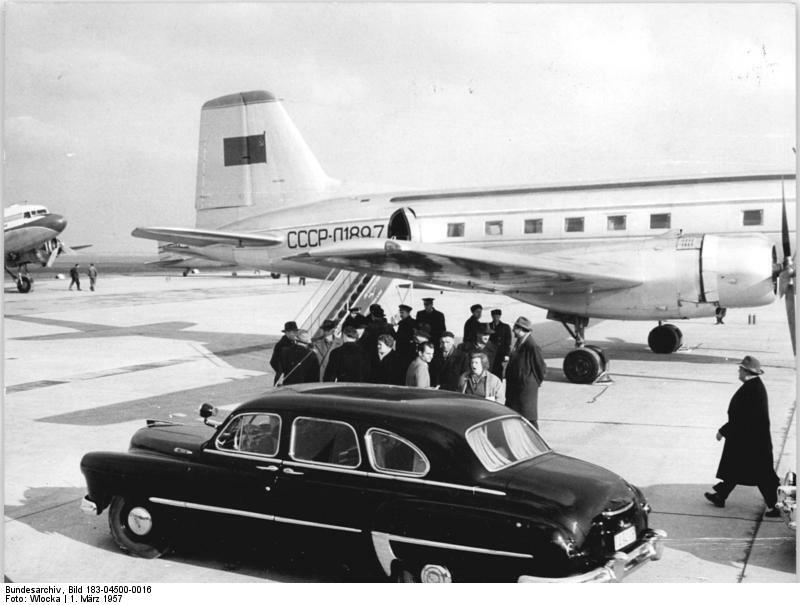 20 September 1949 No Soviet aircraft were observed to be stationed at the LEIPZIG-MOCKAU (N 52/E 21) airfield. A few German workers were engaged in leveling work. Some obstacle lights in the airfield vicinity were burning at night. Comment The statement that no aircraft were stationed at the airfield is in accordance with previous information. The indications are that the field will not be occupied by an air unit in the near future. 1. On 29 September 1949, Mockau airfield (E21) was not occupied by Soviet Air Force units. 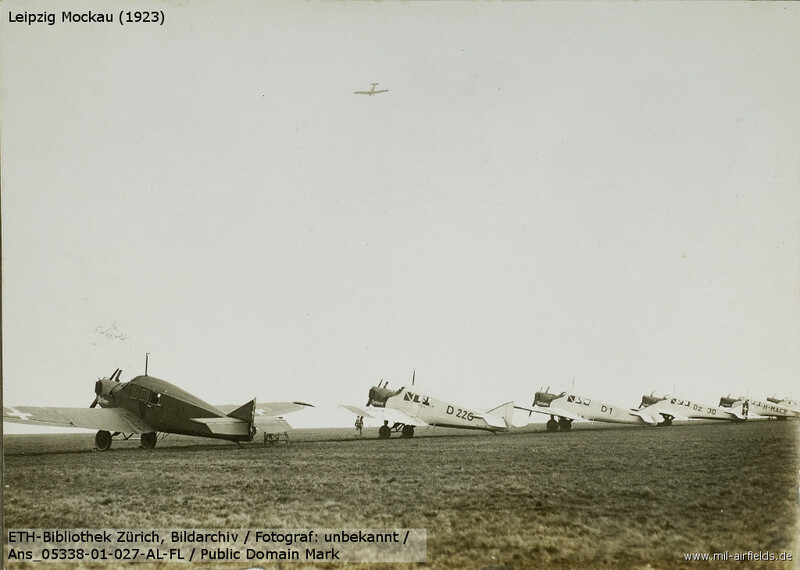 Local residents stated that the last planes seen were transports, which arrived during the last Leipzig Fair period. The field was not guarded on observation date. 2. Mockau airfield lies just north of Leipzig between the rail line Mockau-Delitzsch and the Autobahn. Its flight strip is concrete and measures 1,000 x 40 meters. There are also taxi strips. The remainder of the field is covered with short grass and was not damaged by wartime bombings. It is suitable for immediate use by all types of planes, including jets. 3. All main buildings and technical installations were destroyed, and the field does not have hangars, fuel storage, or night lights. 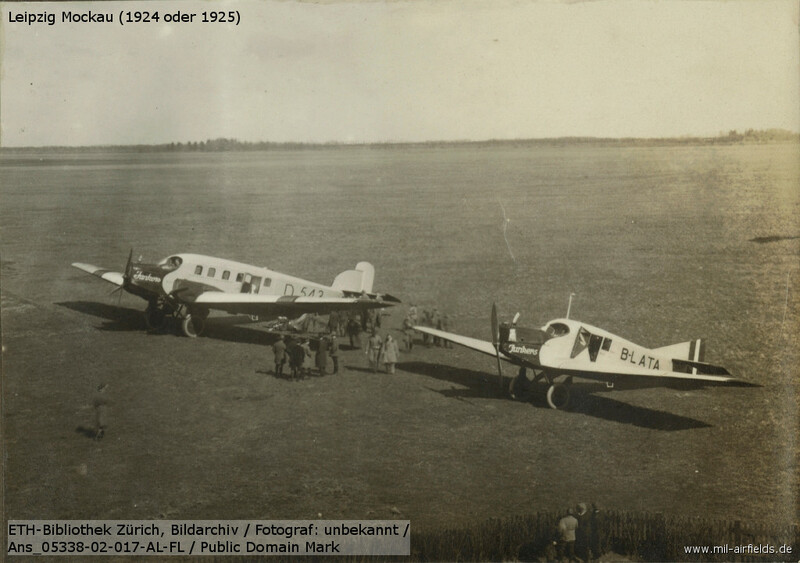 12 October 1949 The LEIPZIG-MOCKAU (N 52/E 21) airfield was not occupied by the Soviet Air Force. 17 October 1949 The field was unoccupied but guarded. The runway and taxiways were serviceable. No work was observed. 17 October 1949 Not occupied by Soviet Air Force troops. Several warning plates had been erected along the edge of the field. A German "People's Police" guard was quartered on the western edge. All hangars were destroyed. There were red obstacle lights around the airfield. 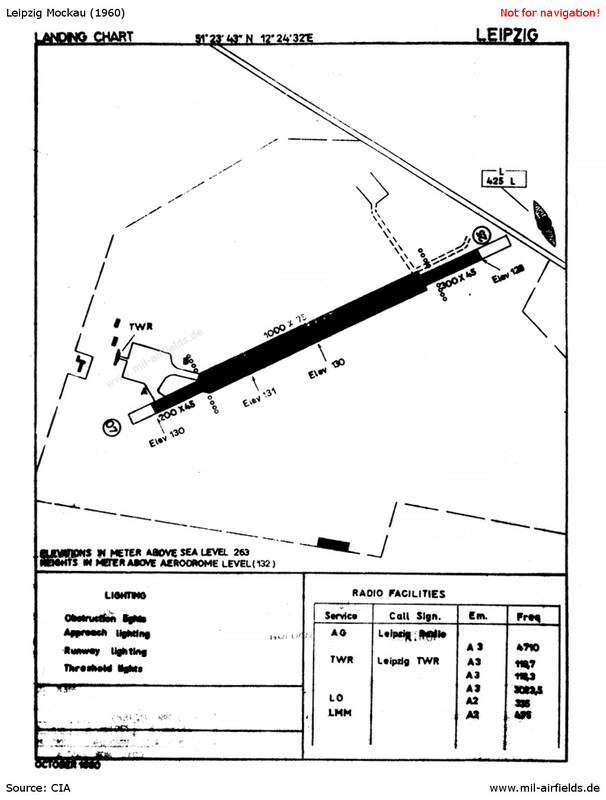 Comment Report confirms that the airfield is not occupied by an air unit. The condition of the field has apparently not changed since 20 September 1949. The landing field is intact. 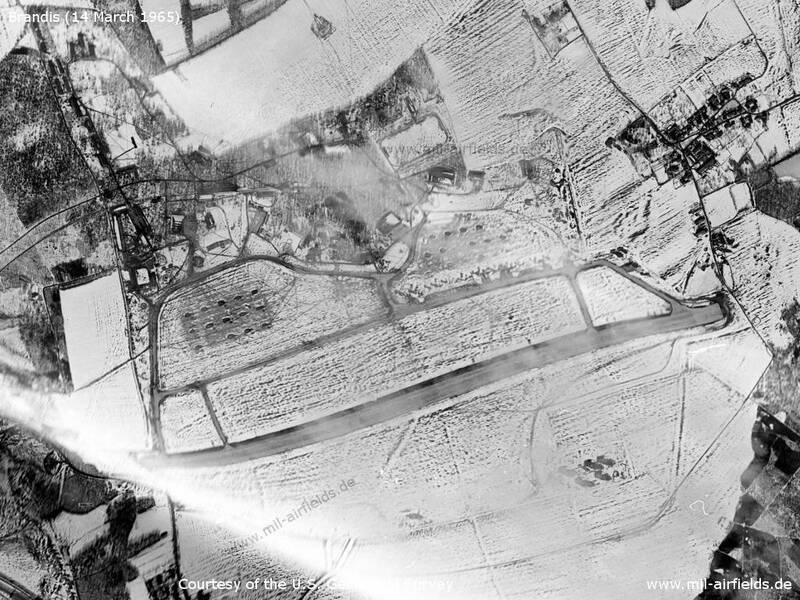 09 November 1949 The LEIPZIG-MOCKAU (N 52/E 21) airfield was serviceable but not occupied by the Soviet Air Force. 16 November 1949 The field was not occupied by aircraft or Soviet Air Force personnel. It was guared by German "People's Police" patrols. Warning signs were erected along the edge of the field. The wrecks of gutted railroad cars were standing on the spur track. No construction work was under way. The red obstacle lights in the field environs were turned on at night. Comment The occupation and condition of the field have not changed since last observations dated October 1949. No air force unit is stationed at the field. At this time, East German airports had location indicators from the series EDX..., Leipzig-Mockau had EDXL. Aerial picture from the 1960s or 70s - Aerial picture from east german field manual "A 042/1/003 Auswertung von Luftbildern" from 1973. 1 - Runway; 2 - Hangar with apron; 3 - Gate and control tower; 4 - Terminal. On the apron, 3 larger aircrafts are visible, maybe Il-14s. Two smaller aircrafts are standing in front of the hangar. The meteorological station at the airport had the ID 10470. 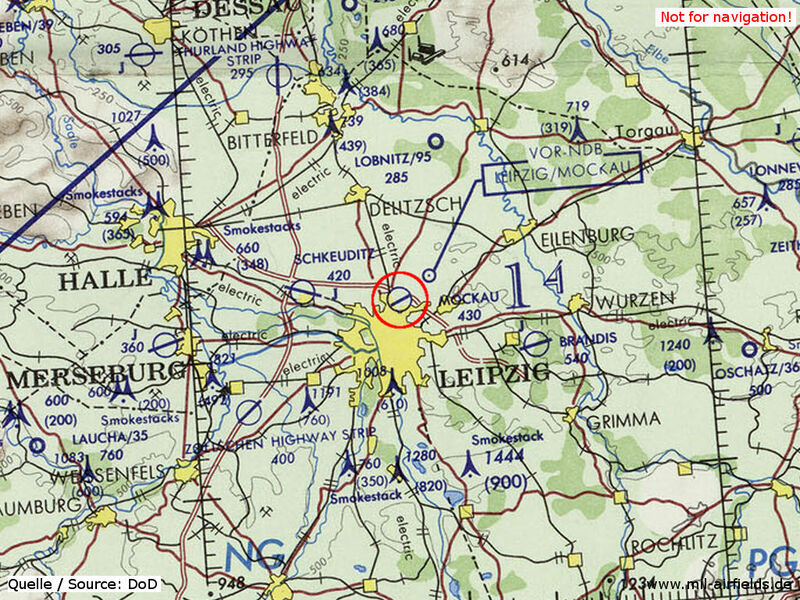 Leipzig Mockau airport on a map of the US Department of Defense from 1972 - This year, the remaining air traffic was relocated from Leipzig Mockau to Schkeuditz. A new building is erected at the airfield for agricultural flight training. The airfield is used by the East German airline Interflug, Agricultural Aviation department, for agricultural aviation training. The field is also used by the pre-military organization Gesellschaft für Sport und Technik (GST). Airfield is closed. The area is used as commercial area. Some old buildings can still be found. Grenzdörfer, Joachim; Seifert, Karl-Dieter: "Geschichte der ostdeutschen Verkehrsflughäfen" Bernard & Graefe Verlag, Bonn, 1997 - Description of history since 1912, pictures, maps. Freundt, Lutz: "Sowjetische Fliegerkräfte in Deutschland 1945-1994, Band 2" Freundt Eigenverlag, Diepholz 1999 - Short description of post-war history; aerial photo from 1953.